If you had to choose one word to describe the community you want children to live in, what would it be? Happy? Supportive? Compassionate? Resilient? When I ask this question to parents and educators, these are the words they choose. These words point to the importance of emotional intelligence - the skills we need to manage our emotions. From happy to sad, loved to frustrated, excited to discouraged - the many emotions children and adults experience throughout the day matter! Emotions impact our ability to respond effectively in social situations, to build positive relationships, to navigate life challenges, and to thrive. 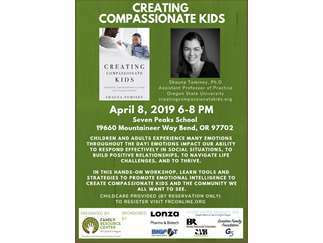 In this hands-on workshop lead by Shauna Tominey Ph.d, learn tools and strategies to promote emotional intelligence to create compassionate kids and the community we all want to see.